Maurie proposed a challenge for our staff at the end of a long, exciting and full-on Term 1. The Challenge to examine how we are developing our Growth Mindsets. Over the past week and a half I have had a chance to think more deeply and reflect upon building and maintaining growth mindset as I attended and participated in both the GAFE (Google Apps for Education) Summit and Learning Network BYOD 2014 conference. I was blown away by the power of collaborative and connected educators sharing their visions, successes and failures in candid and very honest ways. I felt inspired and empowered, if not a little overwhelmed by the depth and breadth of educational practice and thought that I could take and work into my own practice. It also led me to consider where I have been on my own journey and it’s struggles and successes. Suan, Google’s Educational Evangelist, stated in his key note that there are never failures, only learning opportunities. It is only through the greatest failures that we come to know the greatest truths about ourselves and about the world that we live in. 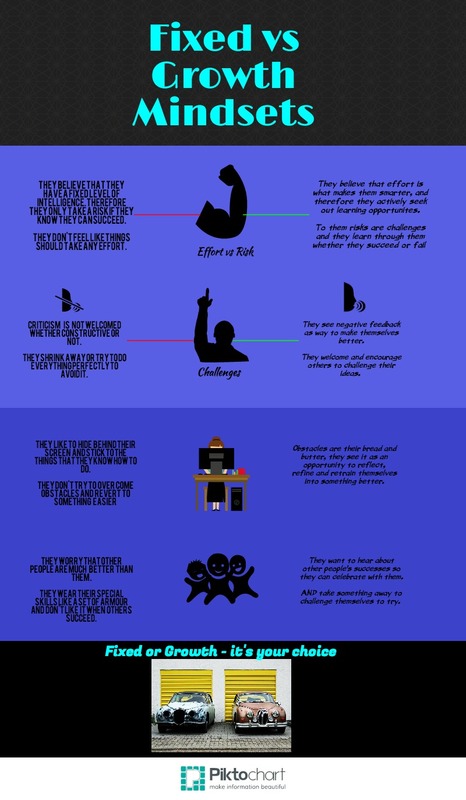 Based on Carol Dweck’s book, Mindset: The New Psychology of Success, I have created an infographic to summarise her findings about fixed versus growth mindsets. The question then becomes which aspect of a growth mindset have I not embraced? Taking on a brand new library from scratch with no experience of libraries was a pretty big challenge, it did not scare or merely excite me, it enthralled and ensconced me. It has been tough, I have a myriad of ideas, other people have even better ideas and then when I look at that combined long list of ideas, compared to what I perceive I have done, I start to wonder if I’m an imposter. But that’s where celebrating the success of others is an awesome and worthwhile aspect of a growth mindset. It was fantastic to sit down at the end of term one with Leigh, my partner in crime, and look at the successes of the library space as a team. I realised that what we had done already was amazing and what was yet to come was going to be even more so. But here’s my flaw, whilst I actively seek and want feedback about how I’m going and where I can go next, it takes me a while to get over or push past that horrible, dreadful and sinking into a pit like sensation that I experience when I know something has gone wrong. My goal this term is to share candidly and honestly about both my successes and failures as a way to encourage and learn from negative experiences. I choose to adopt a growth mindset, it’s not innate yet, but it’ll take effort before I get there. Inforgraphic made with reference to: Dweck, C. (2006). Mindset: The New Psychology of Success. New York, United States of America: Random House Publishing.